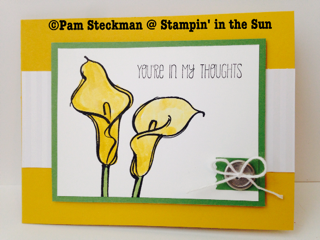 Stampin' in the Sun: You're in my Thoughts using "Remarkable You"
Sometimes we have the best intentions but no energy to back them up! Week 4 of school was great but exhausting! Exciting news is that I will be getting a co-teacher this week so I only have to teach Language Arts and Writing. I have to admit, I was excited to teach all of the subjects, but now that I only have to teach half, I am even more excited. Teaching 5 subjects and trying to make them all interesting and exciting is TIRING! So... hopefully I will have more energy in the coming weeks for other things (like stamping and blogging!). I am in love with this card that Ronda Wade created. I changed it up a bit but I am in love with the Wasabi with the Hello Honey. I used the washi tape punch and cut it in half to create the background of the button. So cute! 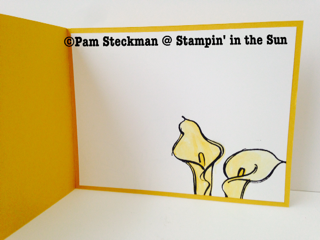 I love how this card opens to the side and the flowers peek out side! Adorable! I am in love with this stamp set Remarkable You. It's perfect to stamp and color in quickly! I used the Aquapainters to paint the pretty flowers. Check out the supply list and let me know if I can help you in any way! Thanks for being my followers and customers!